St George will never rival Scottsdale for sheer numbers of vacationing golfers (not until its sandstone cliffs turn blue anyway). But if there’s nothing left in Scottsdale for you to try, then think seriously about diverting to Utah. There are still places on our green (and, in the case of Southern Utah, reddish brown) and pleasant planet where a golfer's cares simply can't compete with his surroundings. So magnificent and humbling are some golf course panoramas that, no matter how much emotional baggage he brings with him, a golfer's woes will seem trivial by the time he holes out on the last green. We have numerous courses capable of dousing a man's anxieties here in the Pacific Northwest. Forests of evergreens and white-tipped mountains evoke awe and wonder and can take away a lot of the pain that follows a bad hole. Southern Utah may look very different - the red rocks and crumbly desert terrain seemingly a million miles from Western Washington - but the effect is much the same. Here, a player's first comments on finishing the round are likely to reflect the amazing landscape he has encountered rather than any disappointment in his score - "Wow, that was incredible," as opposed to "Blast, not another 87!" Centered around the town of St George are nine courses most of which can justifiably be described, not merely as courses, layouts or tracks, but ‘experiences’. Together, they make up the Red Rock Golf Trail which formed in 2004 and which attracts slightly more than 300,000 rounds a year. 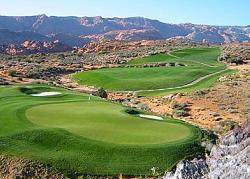 The newest addition is Sand Hollow, designed by John Fought and opened in August of last year to near universal acclaim. Northwest golfers are familiar with Fought’s many skills, of course. Washington National and Trophy Lake in Washington; and Crosswater, the Meadows, The Reserve and Pumpkin Ridge in Oregon, all form part of one of the most impressive portfolios in the business. Though not given nearly the credit his work deserves, Fought has become a master of creating attractive, challenging and strategic courses that appeal to pros and hackers, as well as old and new-school golfers. Actually located in the city of Hurricane about ten miles east of St George (Mayor Tom Hirschi is apparently very proud of his city’s third golf course and quick to correct anyone who unthinkingly says it’s in St George), Sand Hollow is fun from the start but becomes particularly exciting towards the end of the round with half a dozen holes that take you down into a canyon with mesmerizing views of the Virgin River. It’s not altogether surprising that Fought, who loved the place so much he invested some of his own cash in the project, says Sand Hollow was the most beautiful site he’s ever worked with. "Not only were the vistas incredible but the soils were perfect too," he says. "Unlike at Washington National where we had to cover the ground with sand to ensure good drainage, we imported nothing at Sand Hollow. The natural sand was perfect and the water ideal for growing good turf." The course more or less designed itself, adds Fought, the only danger; relying too heavily on the back nine’s backdrop and building a series of kooky holes that might have looked a whole lot better than they played. But Fought is far too canny to have let that happen, instead building a sequence of holes that might be the talking point of your trip to Utah for many years to come. "If it wouldn’t have worked, we just wouldn’t have gone down there," Fought says of the canyon. "And really we had very little earth-moving to do to make it work. We needed to fill in and flatten the fairways at the 12th and 14th, but other than that there was remarkably little to do." As you’d expect, Sand Hollow has the highest green fee on the Trail with peak season (October 1st to May 15th) rates topping out at $125 – a princely sum for 18 holes in these parts but considerably less than what you pay 400 miles south, on the other side of the Grand Canyon, in Scottsdale, AZ. Sand Hollow has another nine holes, known as the Links Course or 'St Andrews Nine', which the owners seem at pains to describe as Scottish. Sure enough, the ground is gently rippled, the bunkers numerous and deep. But that's where the similarities end. The lack of an adjacent sea or ocean, the rocky sage-strewn desert, distant snow-capped peaks and those 500ft red rock cliffs, put this 'links' in a category all its own, somewhat distinct from the likes of Troon, Dornoch or the Old Course. Hurricane’s first course, Sky Mountain, was built by Jack Hardin and opened in 1994. A city-owned track located close to the entrance of awesome Zion National Park, the views are superb though the course itself is laid out on fairly level ground. A round here costs $27 tops, making the ‘staggering view to dollar’ ratio one of the best in the coun world. A few miles east is Coral Canyon which, like Sky Mountain, benefits from its proximity to Zion and the similarly imposing Bryce National Park. Keith Foster, another designer that Seattle golfers know well (because of the wonderful course he built at Druids Glen in Covington in 1998) did a typically fine job of weaving thought-provoking holes through the natural terrain and maintaining its natural ruggedness, rather than blowing it up and creating ‘FosterLand’. The 7,029-yard Par 72 not only opens with two Par 5s, it finishes with three more in the last five holes. It’s certainly not the standard scorecard, but Foster has no problem with that. "I’m not going to bulldoze the place just to be conventional," he says. "I think the course plays very well and that there are some truly wonderful holes. Really, what does it matter how they configure?" With just 80 acres of turf, there is ample opportunity to visit the desert although, unless your ball dives down a ravine or into an arroyo, you should have no trouble finding it. The tiny 6th hole is perhaps the course’s most memorable and should generate cups of adrenaline. A crisp wedge or 9-iron across a deep gulch is all that’s required but, as with so many other dramatic Par 3s, the sight of so much trouble surrounding the green can often provoke the shakiest of swings. 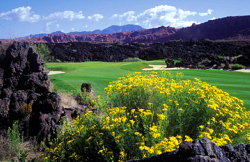 Moving west on Hwy 9, then I-15, toward the city of St George, founded as a cotton mission (hence the area’s nickname ‘Utah’s Dixie’) by Mormon pioneers in 1861 under the direction of Brigham Young, you find half a dozen more courses with a red-rock theme. The Ledges, perhaps the reddest-rockiest of them all, is actually ten miles north of town on Hwy 18, but still very much part of this trail. Designed by Pete Dye’s nephew Matt who sadly lost his battle with colon cancer in August of last year, the Ledges opened in 2006 and quickly became one of the region’s most popular rounds. 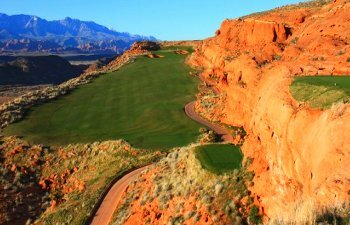 As its name would imply, the nine-hole Dixie Red Hills ($20 for nine holes between now and May) also possesses its share of red-rock glory. Municipally-owned since the mid ‘60s, Red Hills is a fun layout and extremely popular with the locals. On the west side of town is another city course; 27-hole Sunbrook ($56) which ‘Golf Digest’ has twice named the best course in Utah. The Pointe, Woodbridge, and John Harbottle-designed Black Rock nines all make the most of their natural settings, with four of Harbottle’s holes playing through areas of black lava. The pleasant Sunriver ($46) is probably the pick of a trio of layouts on the south side of town although the 7,000+-yard city-owned St George GC ($33) is always extremely popular. Southgate, the last of St George’s four publically-owned facilities is short at 6,100 yards and a haven for retired golfers who appreciate the laid-back feel and emphasis on accuracy over distance. With the Santa Clara River in play on several front nine holes, accuracy is indeed the order of the day. Not part of the Red Rock Trail but a course you really shouldn’t miss if you’re in this neck of the desert is Entrada at Snow Canyon where Johnny Miller and his Director of Golf Course Design Services, Fred Bliss, created an extremely challenging course on high desert and lava rock fields in the city of Santa Clara. A private club, Entrada is accessible only to members and guests of the Inn at Entrada, so do your best to work a night here into your itinerary. Southern Utah is not the first place you think of for a winter golf break. 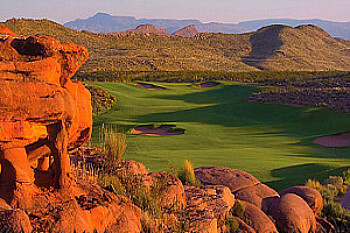 But consider this; daily temperatures hover around the 60 degree mark; there is very little rain (just over an inch in January, the wettest month of the year); green fees are significantly cheaper than those in Scottsdale and Las Vegas; there are no bugs; and Zion and Bryce Canyon National Parks are within easy range. Best of all, the Ledges, Entrada, Coral Canyon and Sand Hollow are all courses you'll rave about on your return and want to play again. Time for a change of plans perhaps? almost touches 70 in March. destinations mentioned above. Sand Hollow is the dearest round at $125. and a half hours to cover the 1,225 miles. redrocktrail.com and click on Lodging. Entrada ten miles north, Santa Clara five miles northwest. ultralighting (very light aircraft), or take a guided photography trip.